The two surveys completed by Helen Ridley and Emma Burnham can be seen at the bottom of this page. Both clients have given their permission to publish their valued comments. 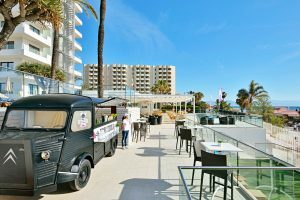 Helen was staying at the Hotel Sol House in Torremolinos and Emma was staying at apartments Las Gardenias, El Pilar, Estepona. The Hotel Sol House is approximately 15 minutes transfer from Malaga Airport. Estepona is one hour and 20 minutes. John and Michael wish to welcome back Helen Ridley. This is a name I have seen on many of malagaairporttransfers.com booking forms. Of the eight questions with rating Helen voted 5 to all. Mombasa in Benalmadena Port was her favourite bar. The beach was one minute walk so there was no need to rent a car. Her party of 12 arrived at Malaga Airport from England on the 15-10-18 staying for three nights and flew with Easyjet, naming this her best airline. The hotel was suitable for disabled persons both in accommodation and the use of the swimming pool. Helen Ridley said she would book hotel again. In other comments she wrote “reliable service from Malaga Airport Transfers again, thank you”. John and Michael would like to say how such comments are always passed on to the drivers that transferred their party and how proud they both are to see this on the forms. Helen Ridley and her group of 12 persons paid 98 euro to be transferred from Malaga Airport to Torremolinos and then back again 3 days later. Emma Burnham’s group of 8 persons stayed in Estepona for 6 nights on the 31-10-18.The eight questions asked received four with 5s, one with 4 and three with 3. Emma flew from Luton airport with EasyJet to Malaga Airport. She rates Virgin as her favourite airline. The party had a 20 minute walk from the villa to the beach that is why she commented on the question renting a car as “depends what you want to do”. Accommodation was not suitable for disabled persons. Emma voted she would book accommodation again. Favourite restaurant was La Sala and best bar Robin Hood. John and Michael would like to thank Emma and friends for choosing malagaairporttransfers.com for using them to transfer from Malaga Airport to Estepona. Emma was charged 190 euro by malagaairporttransfers.com for her transfers from and too Malaga Airport, that is 95 euro each way. Don’t forget you can pay on arrival and we also have free child seats.